There is only a handful online casino out there exclusively played in South African Rand (ZAR). Online casinos which truly want you to be their member have to do whatever possible to make you feel at home, which among other things means you’ll be offered to play and pay in SA Rand (ZAR). We know, that’s what we’re doing! Playing at a Rand casino has plenty of benefits, so let’s make sure you know what to expect from the best. Since you can go to any store and purchase goods and services with your hard-earned SA Rand (ZAR), why shouldn’t you be able to do the same when gambling online? That was exactly our thinking and that’s why Springbok makes sure you can do the depositing and withdrawing in your own currency. Playing at a Rand casino means you don’t have to worry about currency conversion and allows you to avoid costly exchange rates. All bonuses are expressed in ZAR at Springbok and same goes for your bets, so there’s no need to keep a calculator handy and keep doing math while enjoying your favourite casino game. The best Rand (ZAR) casinos will also offer payment options favoured by SA gamblers, such as Easy EFT and SID. Easy EFT is a safe electronic fund transfer which allows you to send money directly from your bank account. It’s very easy to use, totally transparent, and will enable you to make financial transactions in ZAR. You don’t need to open a third-party account, or even be an owner of a credit card! What’s more, EasyEFT will not charge any fees for their services. SID features similar benefits. It’s another option for transferring cash from your bank account by way of Internet banking. No credit card is required and payments are made instantly. SID is supported by all major SA banks, including FNB, ABSA, Standard Bank and Nedbank, employs advanced security measures to safeguard sensitive data, and even offers their clients 100% protection against unauthorised payments up to R10,000. Finding a casino which accepts payment in SA Rand (ZAR) is great, but there are other things to take into consideration. To start with, you need to make sure the casino has good reputation and is licensed by trustworthy regulatory body. You’ll want to be offered large and diverse gaming library stocked by some of the best industry providers, along with numerous and generous promotional deals with reasonable play-through requirements. You’ll want to know assistance will be available when you need it, and in your own language. We’re proud to say Springbok is a Rand casino which has all that and more. 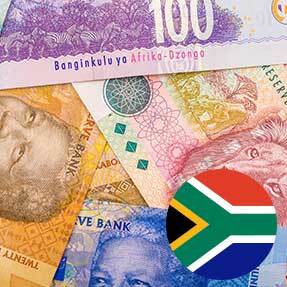 Do you know what is the current exchange rate of Rand (ZAR) to dollar or pound? When playing at a Rand casino, it doesn't matter! Choose one of the best and not only will it allow you to use local currency, but also offer your preferred payment method and speak your language throughout the process. Playing at a casino which feels 100% South African is a unique experience.